If there were a contest to name the most “Gloriously Goofy Golden,” Chandler would have won it paws down. He came to us from a superb foster home where he resided for three months, basking in love and attention like he had never experienced during the first nine months of his life. He was described as a very active young boy with lots of love to give…understatements on both counts. He hated leaving Robin and her family…we believe he knew we were going to take him away from his utopia because he did not want much to do with us when we arrived to take him home with us. He watched out the window of our car until he could not see them in their driveway, and then he jumped into the far back of our Suburban. We drove from North Bend to Lincoln like that, and when he arrived at his new home, he ran to the back of the yard and would not have anything to do with us, no matter how much we sweet talked him, or tempted him with treats. We finally called our 8 year-old granddaughter to come over and to see if she could talk him into being friends. He came right to her, wagging his huge tail for all he was worth. Little did we know that was the beginning of a wonderful ADVENTURE as well as a great learning experience for our family…there never was a dull moment! Almost immediately Chandler attended obedience class. He went every Saturday morning, 19 times, and he was always the most excited pupil to be there. He loved his classmates…he thought they had all gathered together to play with him. He did not notice that those he started with did not also attend 19 times. He just loved being there, jumping 4 feet straight up like he had springs on his feet, and barking if his new friends did not join him in this joyous dance. Incredibly, he mastered Sit, Stay, Down, and Heel. He never got promoted to the next level because he could not learn to pass another dog going in the opposite direction without trying to get him/her to play. His instructors finally conceded that he would be a challenge when we walked with him. But walk we did…Chandler insisted that we get his leash and collar on him before nine o’clock every morning [earlier was better], rain or shine, hot or cold. He loved his walks, 3 and 4 miles, on town sidewalks and on the bike paths around Lincoln. We do believe that he knew he was walking us into robust health…his master/dad had heart bypass surgery about 4 months before Chandler came into our lives and Dad’s walking capacity and speed improved by leaps and bounds as we walked those many miles. We usually completed our walks in an hour and then got ready for the next adventure. He was a good judge of people on our walks and could always figure out who might like him and who might not. When he saw a stranger named Cindy on the bike trail he jumped up, placed his paws on her shoulders and joyously looked at us as though to say, “Here is a new friend!” And how right he was…we all became good friends with Cindy and her husband, Everett, and even got them involved in GRRIN. 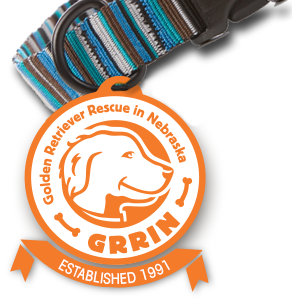 They are still one of GRRIN’s most devoted foster families. When Chandler came to us we already had an elderly resident Corgi, Reggie. Chandler made it his mission to teach Reggie the “Chase Game”, which consisted of chasing through the dining room, leap down one step into the living room, around the furniture and back up around the dining room table…endlessly. It gave Reggie a new lease on life, and probably another fun couple of years of life. When Reggie crossed the bridge, our children felt we, or Chandler, needed another friend. The grandsons almost immediately delivered a 4-month-old Corgi pup named Bear into our laps, and left. Chandler was enchanted to have a new young friend and very carefully proceeded to teach him the “Chase Game”, taught him the yard patrol routine that kept the squirrels on top of the wooden yard fence, and taught him that dogs do not chase cats [we have two]. He always made sure that Bear was in his own crate in the bedroom by 9pm because Chandler had decided that 9pm was bedtime for dogs. He had trouble adjusting to the time changes for daylight savings, but adjust he did after a few days each Fall and Spring. Chandler had a strict rule about stuffed toys…they were not allowed! He immediately tore up any stuffed toy that we foolishly thought he might enjoy, or that our son’s black lab might mistakenly bring into our house. He could not abide rope toys, tennis balls, or anything that squeaked. He loved nylabones, especially the circular ones. He would play tug of war with his nylabones with Bear, but not with us. He would pull Bear all over the kitchen during those games, but oh so gently. The only other thing he hated was the Fourth of July. We never went anywhere on the Fourth because he was so frightened of the firecracker noise. Chandler also was a paper consumer. By that, I mean, he ate paper. He never ate cheap paper…only paper that had value. He liked business letters, bank statements, and personal notepapers. The best were handmade wedding invitation papers. His ultimate paper feast was four or five years ago…that is when he ate 4 Oklahoma/Nebraska football tickets. We don’t believe any of this feasting was his fault…it was ours for being so careless in leaving things where he could find them. He only took an important item off the counter or desk or table if we left it hanging over the edge, making the item or items easy to grab as he passed by. We never witnessed the actual removal of the prize, only an occasional minute fragment, or the ultimate end result in the yard. His last important activity was Gold Rush, 2011. He had been diagnosed with Hemangiosarcoma in August, but he did not know he was sick. 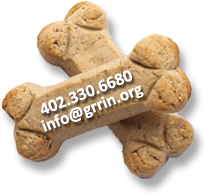 We came with Judy and Cindy, helped Judy set up the GRRIN table, and visited all the dogs and the raffle tables. We entered the Kissingest Golden contest, but Chandler, always a great kisser, would only roll on his back for a tummy rub…not a kiss to be given. We won the beautiful big dog bed complete with lots of toys, and proudly brought it home. Chandler hated the bed and could not be coerced to try it. About a month after Gold Rush, the night he crossed over the bridge, he looked at us, crawled onto that bed, and in a few minutes, very peacefully, he was gone. It has taken these many months for me to be able to write about Chandler because he was so very special to us, and to all who had the privilege of knowing him. He always kept our spirits high, and yes, he had so much love to give, and he always gave generously!!!! We shall continue to miss him.